Imagine this: You got a cool dual loop going, and you can see the crowd is loving it. Out of the blue you engage the Hold FX for a cool rhythmic stutter. The crowd is baffled. Then you reverse your loop and throw them into an otherworldly trance. Finally you hit that Tape Stop FX for a unique jaw-dropping finish to your piece. You look up. The crowd is dumbstruck and smoke is rising from their heads, ‘cause you literally just blew their minds! This scenario (which may or may not have happened) just scratches the surface of what can be done with the 7 on-board FX. 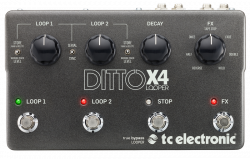 Now throw loop decay and external MIDI control into the mix, and you have a pedal that will continue to inspire you for years to come.